Adjective & noun. Mid-17th century. capillary tube to rise, recede, as a result of surface forces. Thick-walled vessels that carry mainly oxygenated blood from the heart at high pressure. Tiny blood vessels within tissues that facilitate the diffusion of oxygen and nutrients and the elimination of waste. Thin vessels that carry mainly deoxygenated blood back to the heart at lower pressure. 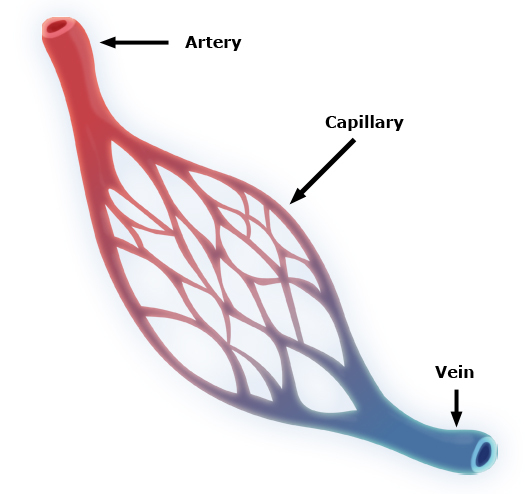 OK, OK ... it's not quite as simple as that; the connecting vessels between the arteries and the capillaries are the arterioles, and connecting the capillaries to the veins are the venules. And, yes, there are different types of capillary, namely the continuous capillary, the fenestrated capillary, and the sinusoidal capillary. But as a very basic, broad, not-studying-biology overview of what arteries, veins and capillaries are, it'll do for now. 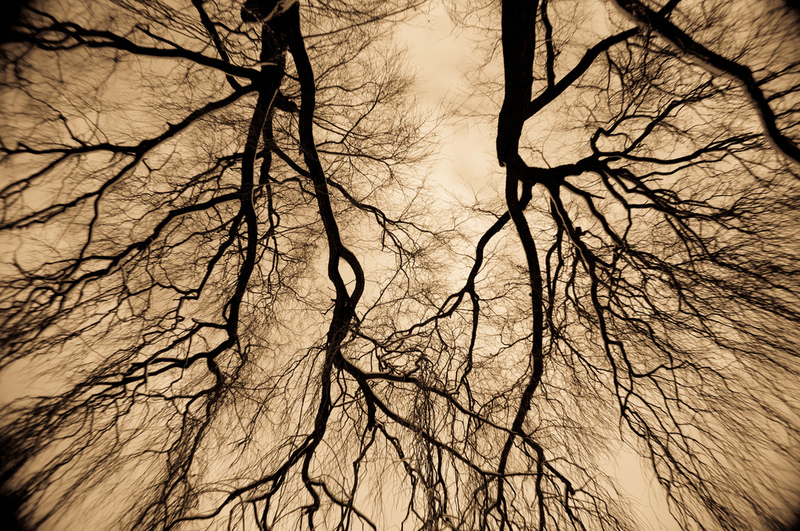 The etymological connection between capillary and the Latin capillus, meaning hair, is easy to understand, considering the hairlike construction and network of capillaries, and English has retained related words like capillaceous, meaning 'hair or threadlike' and capillament, meaning 'a hairlike fibre'. Obviously a capillary's similarity to hair is only superficial, but it does somewhat illustrate just how insubstantial a capillary is. Even so, a human hair is on average 100 microns (micrometres) in width, while a capillary is between 5-10 microns. As a micron is 0.001mm, it's accurate to say that capillaries are very, very, very small indeed. Do you have any capillary facts to share? What in your life is capillaceous? Do please leave your most bloody-minded comments in the box below. Yes. If you line your pond with capillary matting then the next morning you will find it completely empty. A pond? Oh how very middle-class indeed! I'm afraid I've never had a pond, Sally, let alone one with capillaried matting. Middle-class? Nah, just 'O' Level Physics, Ed. We're so common even the frogs shun our pond - and the newts keep us awake with drunken choruses of NO ONE LIKES US. Luckily, being Millwall supporters, we don't care. Back in my days as an explorer, I once distractedly wandered into a disreputable housing estate whilst pursuing a rare butterfly. I was ambushed by a small band of snotty teenage natives in hoodies. Fortunately I'd had porridge that morning, made with free-range organic oats, so had my wits about me. In a flash, I amazed them with a brief demonstration of capillary action using my trusty junior chemistry kit. I withheld an explanation of intermolecular forces in the liquid and adhesive and cohesive forces between the liquid and glass, instead proclaiming myself a gravity-defying deity, an angry gravity-defying deity who wanted his glasses back and who was seriously considering turning them into ballet-dancers, or social workers. They quickly made me king and built me a little throne out of tyres and a supermarket trolley. I was finally usurped by a little squirt with a laser-pointer keyring. Free-range porridge oats? They're going on the shopping list, along with homoeopathic eggs and chakra cheese. And this is a good lesson for everyone in school, C, where you spend most of your time thinking "When am I ever going to need this stuff in the real world?" Well it doesn't get any realer than chasing butterflies in bad estates, so pay attention. You never know when this arcane knowledge will come in handy. Cara Sposa - "One's Dear Wife"